My wife Karen Myers recently started writing fantasy novels. Karen is a technical early-adopter, so, typically, she has opted for Independent Publishing, and is an active reader and correspondent these days in Indie Publication forums. One of her Indie correspondents recommended to Karen the hot new Indie-published book these days. 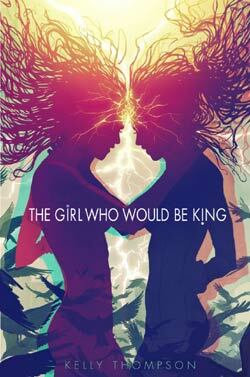 Its title is The Girl Who Would Be King. Taxonomically, GWWBK is a Young Adult fantasy, but I think it is really a comic book/graphic novel, which (at the moment) is lacking its illustrations. GWWBK is the story of two orphaned girls, one good, one bad, who both discover that they possess superhuman strength and healing abilities. The good redhead, Bonnie Braverman, devotes her newly discovered talents to fighting crime and helping people in distress. The bad blonde, Lola Lefever, becomes a serial killer, equips herself with a gang of criminals, and has a go at making herself King of Los Angeles. The two girls share a mysterious link and are inevitably destined to fight. One Feedback on "The Next “Hunger Games”"
» More THE GIRL WHO WOULD BE KING Goodness!